TV is coming to the Web and there is nothing that can stop it. Just ask Avner Ronen, the CEO of Web TV startup Boxee. Later tonight, he will announce the general availability of his Boxee Box, a small device you hook up to your TV and the Internet so you can watch video from the Web on your TV. The videos come not only from YouTube, but also from ABC.com, NBC.com, CBS.com, Comedy Central, and many other video sites on the Web. I visited Ronen today at his New York City offices where he gave me a demo of the Boxee Box (more on that in a later post), but we also got into a very interesting discussion about how the major TV networks and media companies are reacting to seeing their Web videos increasingly turning up on large-screen TVs. It is not a foregone conclusion that the media companies who control the most popular TV shows and movies will play along. Just last month, when Google launched its competing Google TV, it was almost immediately blocked by the major TV networks even though it was simply grabbing video freely available on the Web. Hulu also blocked Google TV. Effectively, the media industry is now discriminating based on device and what kind of browser you are using. I pointed out that what seems to be happening instead is that the TV networks and movie studios are trying to replicate the business model of cable TV on the Web, by granting access only to services which pay them hefty fees like Netflix does (to the tune of an estimated $2 billion next year). Ronen is actually fine with making people pay for content, and in fact says that he will make one-click payments part of the Boxee service itself. Next year,” he reveals, “we will launch a payments platform on Boxee. With one click you will be able to subscribe. We think that will be part of the solution.” You can watch videos behind Web paywalls today on Boxee, but you have to enter a different username and password for each site. 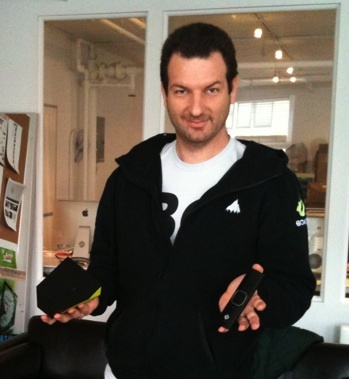 Boxee’s payment service would be single sign-on and manage all the subscriptions in one place. What he suggests is a classic freemium model. If you want new shows and videos as soon as they come out in HD, you pay a few bucks a month to NBC or HBO and you can watch those shows on Boxee, your iPad, your computer or anywhere you want. Then a week or so later, it comes out free on the Web in standard definition with ads. The we-support-subscriptions argument is also one the Google TV folks are making. Watch the shaky-cam video below for more of his thoughts on the matter.